Hale Kea is a newly renovated Hawaiian-style home designed for casual living and family entertainment. There are two master suites, both with air conditioning and a small guest bedroom with a double bed. All bedrooms have TVs. The living, dining and kitchen area is air conditioned and all rooms have ceiling fans. 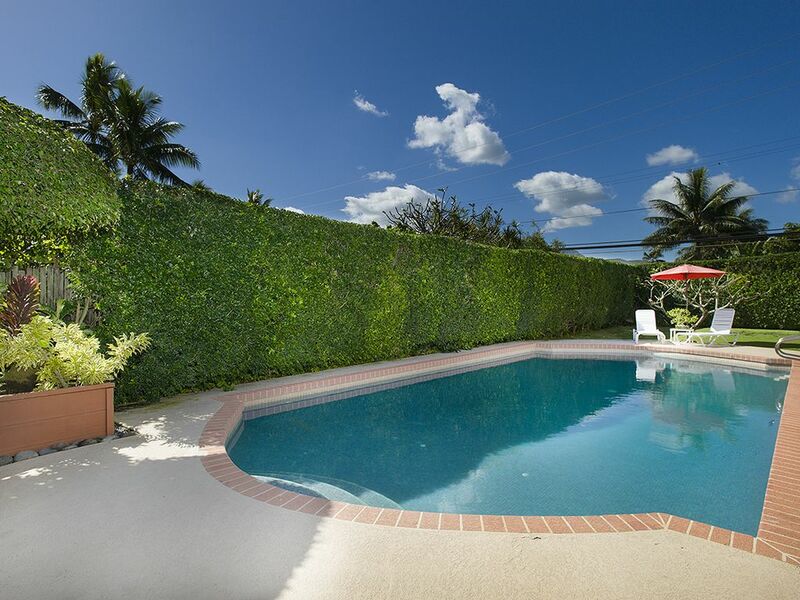 The home is located on a beach lane just a short walk to beautiful Kailua Beach. This property captures the essence of cool, tropical living. Designed for indoor/outdoor living, this Non-Smoking home provides guests with all of the amenities expected to make your stay relaxing and memorable. With family living in mind, the kitchen and living room open on to the spacious, covered lanai. The large, sparkling swimming pool (heated to 85 degrees year round) compliments the entertainment area and provides a perfect setting for intimate gatherings. Assorted puzzles and Legos, etc. Our group (2 couples) rented Sue’s home for 8 nights late November / early December. Sue and her husband stay in a suite above the garage but we only saw them once briefly, in passing. The rental had everything you could possibly need and was extremely well organized as well as spotless. Having a washer and dryer was a huge bonus, particularly if you are staying more than a week. The outdoor shower and pool permitted us a quick dip before dinner or after the beach to get some sand and salt off. The kitchen was almost as equipped as my own, and there were several spices and condiments as well as a nice welcome basket of supplies. The beach access was as good as being beachfront and it’s a spectacular section of beach where mostly locals walk in the morning because it is some ways from the beach parks. The week we were there, the Vans Surfing World Cup was on and the competition was rescheduled and beaches on the North Shore were closed because of the High Surf Warning. I’m talking 30-40ft swells! But Kailua’s waves stayed just right: big enough to play in, but safe for kids. Kailua town has everything you need to eat in or dine out. Sue has compiled a handy folder full of information about restaurants, taxis, must-see sites, safety info, and local shopping. I will never stay anywhere else on the island than Kailua and will definitely be back to Hale Kea. Gorgeous, well maintained and well stocked. Very clean, spacious and well maintained property. We have rented several vacation homes over the years and this one was the best stocked I have ever rented. Pool was gorgeous and quiet, just what we needed. Plenty of pool and beach toys provided as well as pool towels. You really could just bring a bathing suit and your toothbrush and settle right in. Very gracious hosts! The basket of local products was a sweet touch. We will be back! Sue was an excellent host. House had everything we needed! Everything was as described. Loved the pool, and the short walk to the beach. The beds were comfortable and relaxing. I highly recommend this property for a family looking to stay on the beautiful side of Kailua. Extremely well appointed and cared for home. Great pool and outside entertainment area. Lots of pool and beach toys available. Short walk to Kailua Beach. Sue and Peter super attentive but non-intrusive. Be prepared to fall in love ... with the perfect home, great location & wonderful hosts. Truly a lovely home, spotless, up to date with a very liveable floor plan. Our family of one couple & two singles was well accommodated with the two master bedrooms & a single bedroom layout. Very spacious, clean & well organized kitchen, comfortable family room & dining room all overlooking a beautiful backyard & lovely swimming pool. The entire home was open, bright & airy. Down a short path to stunning Kailua Beach or a short drive to restaurants & shopping. As convenient as everything is the home is also private & quiet ~ a perfect combination. Our hosts were just what you’d hope for ~ warm & welcoming but also very unobtrusive. Just delightful! Of the dozen or so rental homes we’ve tried over the years Sue & Peter’s property hits every mark! Tax (calculated on base rent only): 14.962% Departure Cleaning Fee: $450.00 Refundable Security Deposit: $500.00 Tax ID W40365310-01 **Please email for last minute rates and off season rates! ** Rates are subject to change until reservation is confirmed by payment. This property may require a 30 night minimum. Please contact us directly for current specials.